Aprendizaje Móvil es una aplicación desarrollada para laplataformaCLAP. Es una solución que permite gestionar iniciativasdeformación y distribuir materiales de soporte al trabajo deformarápida y segura a través de teléfonos inteligentes oSmartphones.Con la aplicación Aprendizaje Móvil de CLAP,colaboradores,clientes y aliados podrán utilizar sus Smartphonespara acceder amúltiples recursos para capacitarse y para mejorar sudesempeño enel trabajo. CLAP es una solución diseñada paraorganizaciones quecuentan con fuerzas laborales móviles, querequieren de altosestándares de seguridad y de una infraestructuratecnológicarobusta y escalable. CLAP es una herramienta dinámica,flexible,que permite desplegar contenido de capacitación y apoyo altrabajoen diferentes formatos, a usuarios seleccionados yhabilitando elseguimiento de las actividades de los mismos dentrode laaplicación. Mobile learning is an application developed fortheCLAP platform. It is a solution that allows you to manageanddistribute training initiatives support materials to workquicklyand safely through smart phones or Smartphones. 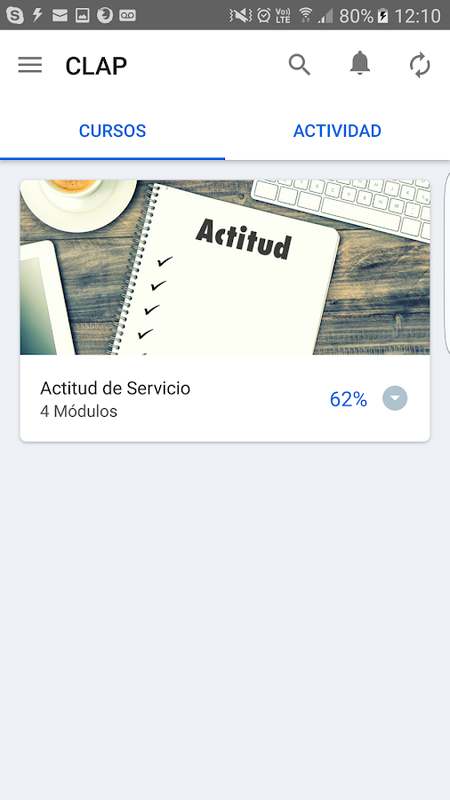 WithMobileLearning application CLAP, employees, customers and partnersmayuse their smartphones to access multiple resources for trainingandto improve their performance at work. CLAP is a solutiondesignedfor organizations with mobile workforces that require highsafetystandards and a robust and scalable technologyinfrastructure. CLAPis a dynamic, flexible tool that allows todeploy training andsupport content to work in different formats, toselected users andenabling monitoring activities within the sameapplication. Institute of Microtraining questions traditional learning methods.With our innovative learning app "Microtraining" we are offering amobile way to secure knowledge sustainably in a playful way! A mobile learning app that helps you deliver training in smallchunks of information using a micro-learning approach. An idealtool for mobile training that enables users to take their learningon the go. Learning cards are built on the web and deliveredthrough the app to train people on any topic and training scenario.With this app Learners can: -Take their training anywhere,anytime-Access bite-sized learning resources that are easy todigest -Take tests to ensure that they will retain the knowledgegained-Gain an overview of their performance through the use ofgamification elements-Learn everything needed in a fun, fast andeasy way *A subscription to TalentCards is required to use the app. Note: You will need to create a Goocus account before using thisapp. Overview: Goocus is Japan’s one-and-only learning app“specialized on Smartphones,” which has been adopted by a number ofbusiness enterprises and educational institutions. Features: Adesign that pursues user-friendliness on smartphones Graphsvisualizing the achievements In nature, gaining a new knowledge isa fun thing to do. With Goocus, bring back the fun of “learning”that you have left behind somewhere. ISMA's (Indiana State Medical Associations) fast and easy way tolearn on the go. Our mobile app, built by ProLearn, allows you toaccess the latest and most up-to-date CME content anywhere. You canfind great courses and start, stop and return to your learninganytime, anywhere! Features: - Viva Learning is an ADA CERP recognized provider -Watch live and on-demand continuing education webinars -Participate in live polling and ask the instructor questions - Takeexams and immediately view your CE Proof of Attendance - Browse theentire Viva Learning library of over 800 hours of CE and hundredsof timely product tutorials - Discover new clinical techniques andproducts discussed by expert clinicians Download the Viva LearningMobile™ app today. Dental continuing education has never beeneasier! Pocket U is a mobile learning application specifically designed foremployees of the registered private organizations to learn on amobile device anytime and anywhere. This is NOT open for publicuse. The mobile learning solution for users within the Last Mile team tobe updated on notifications, courses and assessments. This app willrequire an active login ID. This app is developed by FirstventureCorporation Pvt Ltd, based in Mumbai, India.